So I was walking along the towpath, looking down for flowers of course, when this loud FLUMPH! startled me. I’d just been strafed by an owl! 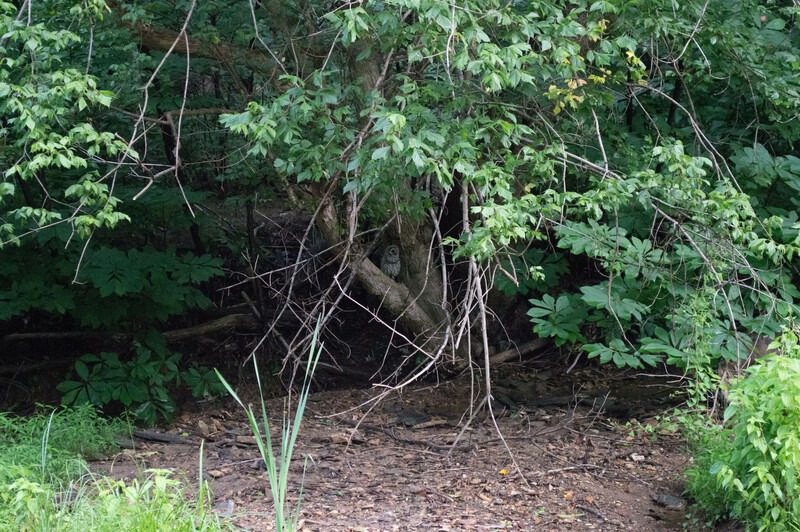 He disappeared into trees across the canal with a loud call. I couldn’t find him, but then I heard the sound again, in two different places. In the deep, deep shade of a sycamore and some pawpaws were two birds. One was clumsily flapping around, down to the ground, then to a low branch, then back up to perch near the other bird, which was stationed on the same branch the entire time. I’m pretty sure the one bird was a fledgling. Go to owlpages.com, scroll down to “calls”, and click on “juvenile” to hear what I heard. I don’t have any sort of zoom lens. I zoomed as much as I could with the 55mm lens, used a wide open aperture and as slow a shutter speed as I dared, ISO 6400. At home I used Lightroom to zoom in to the subject (in the untouched photos all you can see are dark blobs). I took 70 photos in 17 minutes. Here’s a completely untouched pic; click on it and zoom in to see the bird perched in the V of the tree. Very excited and happy. 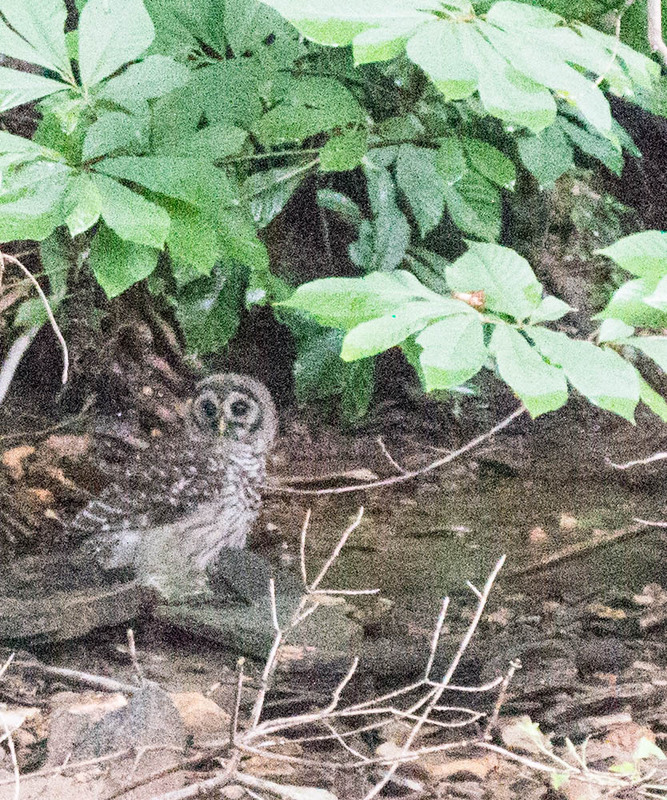 I hear these owls at night fairly often, but the is the first time I’ve ever seen one – or three. This entry was posted in Uncategorized and tagged birds, owls by elizabeth. Bookmark the permalink.